Even a World Series victory for his beloved Boston Red Sox wasn’t enough for Phil Klotzbach to take his eyes off his unending hurricane watch. A morning spent relishing his team’s triumph was quickly interrupted as news of a storm tearing through the Caribbean flashed across his computer screen. “Whenever there’s hurricanes around I get very distracted,” he said. A marathoner, mountaineer and wunderkind who graduated college at 18, Klotzbach predicts the fury Nature will unleash during each Atlantic hurricane season as the lead forecaster of the Tropical Meteorology Project at Colorado State University – and he’s only 27 years old. The seasonal hurricane forecasts that began in 1984 were spearheaded by William Gray, 76, a noted hurricane expert who has studied the storms since the 1950s. Since then, the forecasts have been highly publicized and can even influence insurance rates in hurricane-prone areas. They give people an idea of the severity of the upcoming season by estimating the number of storms and the probability of a strong storm reaching the U.S. coastline. Klotzbach and his team release four predictions: one in early December, almost seven months before the hurricane season begins on June 1, followed by updates in early April, late May and early August. In each report, they predict the number of named storms (tropical systems packing winds of at least 39 mph), hurricanes (at least 74 mph) and intense hurricanes (at least 111 mph) for the Atlantic. When conditions such as sea surface temperature and pressure resemble those of a previous year, Klotzbach said, he can get a good idea of what to expect for the upcoming season. The last two years have been considerably less active than he predicted. “I don’t take it lightly,” he said. “When you have a year when you don’t forecast well, it does irritate me.” For the 2007 season, which ended Nov. 30, Klotzbach predicted nine hurricanes, five of them intense; however, the Atlantic only churned out six and two, respectively. Klotzbach takes his work seriously, but that doesn’t mean it’s always on his mind. A true Colorado outdoorsman, he has run marathons and scaled all the 14,000-foot peaks in the state. 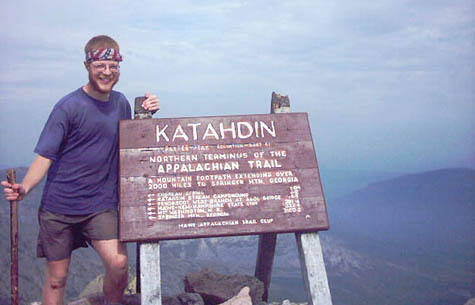 In 2002, he filed hurricane forecasts while hiking the 2,100-mile Appalachian Trail from Georgia to Maine. “You get better thinking done at 14,000 feet with less oxygen to the brain,” he said. While Gray still contributes to the forecasts, he has taken a backseat in the process while pursuing his work with global warming. Gray has distanced himself from the mainstream scientific community by publicly arguing that humans are not responsible for climate change. While Klotzbach said he is not a global warming expert, he does agree with his mentor on the relationship between climate change and hurricanes. In its latest report, the Intergovernmental Panel on Climate Change said recent stronger hurricanes are “more likely than not” caused by man-made global warming. Like Gray, Klotzbach strongly disagrees with this point. “We haven’t seen much of an impact globally on tropical cyclones,” he said, noting neither frequency nor intensity of storms has been affected. He said the best models predict a 3 percent increase in the storms’ wind speed over the next 100 years, a barely noticeable change. Whether cheering on the Sox or hiking three miles above sea level, Klotzbach is above all a self-proclaimed weather geek in charge of a buzzing area of science. “He’s a future leader in the hurricane prediction field,” Gray said. Not bad for someone who just received his Ph.D. NOTE: Klotzbach and Gray released their 2008 forecast on Dec. 7. They predict an above-average season of 13 named storms and seven hurricanes, three of those intense. They also provided a 60 percent probability (compared to an average of 52 percent) of a major hurricane making landfall in the United States. Click here to learn the scientific and statistical methods behind the latest forecast.